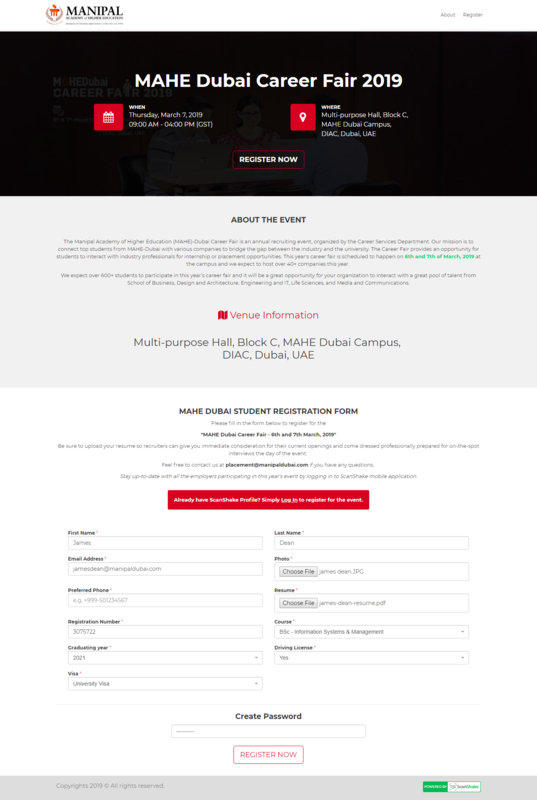 Manipal University of Higher Education – MAHE Dubai is a branch of Manipal Academy of Higher Education – MAHE India. The branch was established in the year 2000, has a student population of 1,500 from 26 countries, and is a highly reputed Indian multidisciplinary university in the region. The state-of-the-art campus located in Dubai International Academic City (DIAC) is offering some of the best programs in engineering, bio-technology, information technology, media & communications, and more. – A high traffic event, the annual career fair with an expected audience of 600 students and 40+ companies, made employer and job seeker communications difficult and haphazard. – Paper-based resume collection was a huge obstacle for exhibitors; frazzled interactions led to misplaced applications, and valuable talent slipping through the cracks. – Error prone and time-intensive data entry of resumes was a daunting struggle for recruiters to manage post event. – Lacking searchability, and the ability to build necessary talent pipelines, short listing candidates was a tedious process for employers that slowed down hiring. – Recruiters had no way to record the context of conversations had with attendees; high potential candidates could not be retraced in the stacks of hundreds of hundreds of resumes received. – Streamlining student and exhibitor engagement on a limited budget to ensure high placement volumes was difficult. – Students felt demotivated after the career fair; lost business cards or no contact information of recruiters led to a job search dead end. – Measuring event success and ROI was an uphill battle due to no reliable analytics or reporting tools available. ScanShake focused on providing the host with cutting edge solution to simplify resume submission for students, alongside helping recruiters build a resume database of all the talent they engaged with- all using ScanShake’s mobile app. An outstanding career fair that provided exhibiting employers access to paperless resume capturing, the seamless on-the-spot digital exchange paved way for focused interactions. The team’s top notch customer support ensured a glitch free experience, and an event that was satisfying for employers and attendees alike. 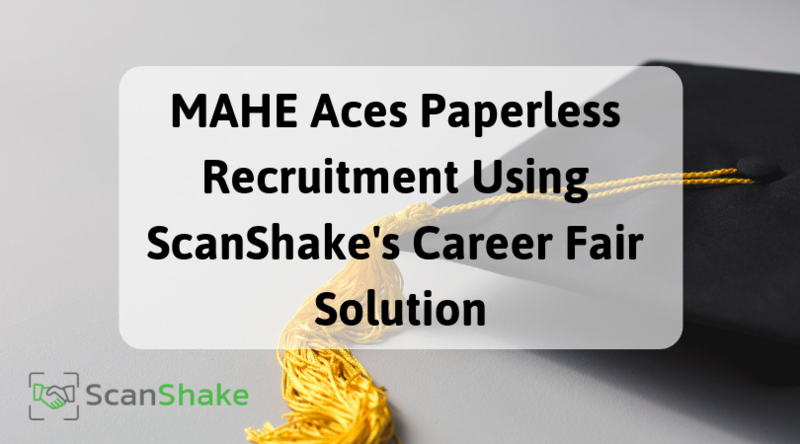 ScanShake’s app provided recruiters with the convenience to break free from overwhelming piles of paper based resumes that were troublesome to manage. Simply being able to instantly capture profiles based on QR codes scanned from job seeker’s mobiles was a huge relief. This meant no more juggling around of resumes, or illegible scribbles indicating feedback noted in a rush. Streamlining networking between students and employers relied strongly on ensuring that the mobile app was easy to use. ScanShake secured a high adoption rate by providing visitors valuable information right at their fingertips including employer listing and company profiles to support a focused job search strategy. Exhibitors set up their profiles to facilitate a seamless 2-way information exchange to help everyone unanimously save time, and successfully cater to a large volume of students. The impact of a career fair depends on its ability to draw in candidates, and incentivizing them to actively participate in the event. The ScanShake app for students was a powerful time saver that allowed them to quickly submit their profiles to exhibitors based on their unique QR code, and in turn receive the exhibitor’s contact card for an effortless information exchange. To truly make the career fair stand out from the crowd, the ScanShake team provided Manipal University with a custom designed landing page. Using fields of critical important to employers such as graduating year, course type and visa status, the host could zoom-in on data that helped produce reliable post-event trend analysis, and identify most active segments of the student population, etc. Recruiters loved using the ScanShake app because it allowed them to add searchable tags, notes and “star” profiles to help inch closer to finding the right candidates. By being able to make notes of the context of conversations had, and any exceptional skills that the student possessed, exhibitors could enjoy on-the spot shortlisting privileges they had always desired. Students could also add notes to keep track of key skills to promote, and any special role requirements, mentioned by the exhibitors – remembering interactions was no longer a challenge. Empowering employers with a candidate pipeline, the long term value to be derived from the career fair participation was tremendous. The app’s digital convenience meant that all resumes collected via the ScanShake app were added to an online resume database that could be easily accessed via desktop and mobile devices. Enabling collaborative decision making and candidate searches based on desired criteria, the profiles could be smoothly exported to support both current and future recruitment needs with utmost efficiency. 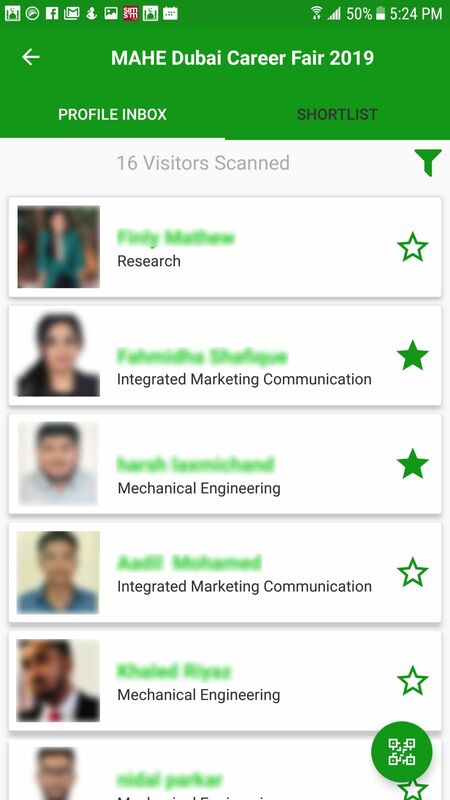 – Career Fair Engagement: With over 1400 resume scans recorded at the event, employers captured tons of candidates through their mobile app to export and share with teams for further review. – Scanning Velocity: Upto 3.28 scans/minute meant that employers were able to move through their queue quickly, capture student information, and keep the conversation moving with new prospects. – Student Interest: 700+ students got their profile scanned once; the mobile solution delivered a great student experience, in addition to providing them the contact card of the employer that scanned them to support future dialogue. – Shortlisting Efficiency: Over 130 students were shortlisted at the career fair. Being able to track majors in demand, employer preferences and shortlisting criteria helped Manipal identify ways to promote their other students and become a preferred talent source. 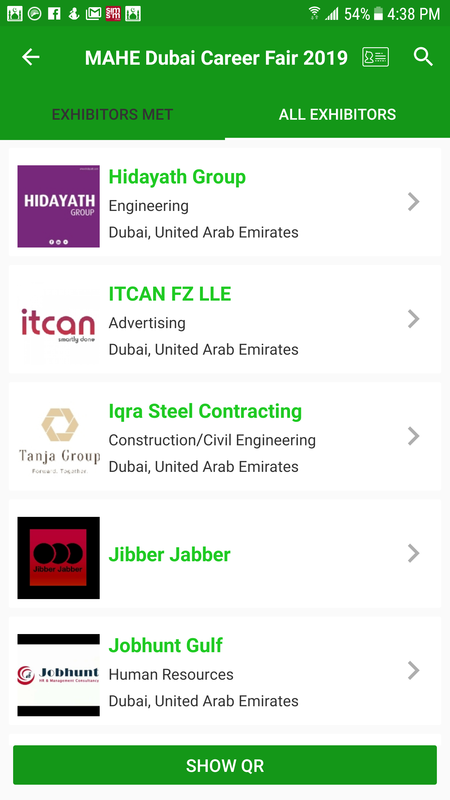 – Employer Relationship Management: Al Abbas Group, Jibber Jabber and QnA International emerged as employers with the highest scanning activity- valuable connections for MAHE to nurture and uphold for future placements.